Lynn Thomas Rees, beloved husband, father, grandfather and great-grandfather, passed away peacefully on May 13, 2018 at the Country Oaks Care Center, at the age of 82. Lynn was born on September 18, 1935 in Coalville, UT, the third child of Jacob and Neta Rees. He is preceded in death by his brother Dean, and survived by Ward, Donna, Alfred and Afra. 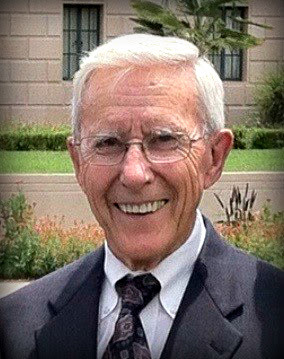 He married his sweetheart, Ellen Elizabeth Gines, in the Salt Lake City, UT LDS Temple on June 10, 1955 and is survived by their five children, Pam Peterson, Denise Clouse (Curtis), Allison Riesterer, Lana Mitzel (Bill), and Mark Rees (Laurie); 21 grandchildren; and 34 great-grandchildren. Lynn attended high school in Coalville, UT, graduating early and earning a scholarship to the University of Utah where he earned a degree in electrical engineering. His early career was working for Sperry Rand in Utah, Toledo Scale, and then moving to Arizona in 1965 where he worked for Motorola Semiconductor until he retired. He spent many hours tinkering in his shop, always building, inventing, and improving on existing and future projects. He was active in the Boy Scouts of America for many years and loved being out in nature and spending time teaching and participating with both the young men and their leaders. His sense of patriotism and love of his country was imparted to all who worked with and knew him, whether at home, church, or in his civic duties. Always an active member of The Church of Jesus Christ of Latter-day Saints, he served in bishoprics, on the Stake High Council, and as Bishop for many years. After his retirement he served as a missionary for his church in the Australia, Brisbane mission with his wife, Ellen, and enjoyed that service enormously. His gifts of service were many, including church, family, community, and any neighbor in need. His positive attitude, enthusiasm, and love of learning were trademarks he was well known for. Funeral services will be held at the Kleinman Park Ward building at 616 S Extension Rd, Mesa, AZ at 10:00am on Saturday, May 19, 2018. There will be a viewing on Friday, May 18, 2018 from 6:00 to 8:00pm and Saturday morning at 9:00am. Interment will be at the City of Mesa Cemetery at 1212 N Center St, Mesa, AZ 83201. So sorry for your loss! Lynn was a great guy! I know Tom is greeting him on the other side. He thought a lot of Lynn. My condolences to all of the family. I know he will be missed by many! I’m sad we did not know about Bro Rees’ service, we would have loved to attend. He was such a kind happy GENTLE man, and always so proud of his wife & kids. Am I remembering that he was super intelligent and invented some important things while he worked at Motorola?? I will admit, that I didn’t know whose parent he was for awhile, but that he kept attending all of our Jr High choir concerts – – – I thought for sure he was a famous TV game show host with his big happy smile! His life was worth celebrating, I’m sorry we missed it.